Please join us on the De Soto National Forest for an excavation of the prehistoric "Tiger Creek Lookout!" The site is on a high terrace overlooking Tiger Creek, one of the main drainages that flows into the Biloxi River, which was a major prehistoric (and historic) travel route inland from and to the Gulf Coast, and connected several important procurement sites, as well as providing natural "roads" between cultural entities. Tiger Creek Lookout is a multi-component (ca. B.C. 1,000-A.D. 1,100) site that has yielded artifacts (mainly pottery) that have not only been found at other sites on the Forest, but also types from Northern Mississippi, the Mississippi River area, and as far afield as the lower Alabama/Florida region. This season, we will excavate the site for objects and features that may help determine the precise relationship among the sites in the area. 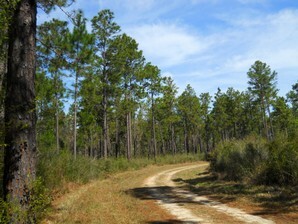 We'll be working on a wooded strip of Forest Service land north of the Gulf Coast. We'll be hiking to the site each day from a base camp. The route involves walking a short distance along a temporary trail through the woods, and supplies and equipment will have to be packed in, but it will all be worth it! If you're able to laugh, have fun, and listen to bad jokes by the archaeologist (when he has a good "bad" one). then this project is for you - we hope to see you this fall for another unique excavation opportunity on the De Soto!